In 1995 Mark Noll wrote The Scandal of the Evangelical Mind, a book directed towards Christian academics that was, thankfully, read widely beyond academia. The book’s hook came in a phrase often quoted over the past 15 years: The scandal of the evangelical mind is that there is not much of an evangelical mind. A bit of a downer, yes, but the book provided the implicit expectation of the compatibility of evangelical convictions with a robust life of the mind. 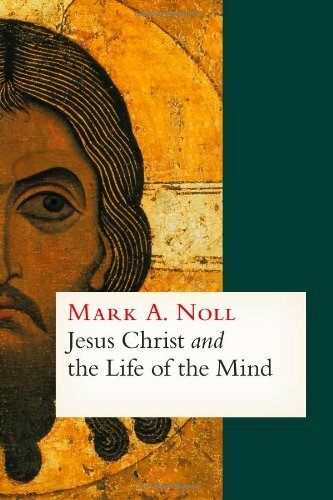 In his new book, Jesus Christ and the Life of the Mind, Noll demonstrates how it is precisely these deeply held convictions that provide the rationale for unapologetic engagement with the academic disciplines. Once again, regardless of its intended audience, this is a book that deserves a wide reading. Noll, formerly a professor of history at Wheaton College and now at the University of Notre Dame, is straightforward about the reason he believes evangelically-minded people should care deeply about learning. Thus, the greatest hope for Christian learning in our age, or in any age, lies not primarily in heightened activity, in better funding, or in strategizing for the tasks at hand – though all these matters play an important part. Rather, the great hope for Christian learning is to delve deeper into the Christian faith itself. And going deeper into Christian faith means, in the end, learning more about Jesus Christ. Put most simply, for believers to be studying created things is to be studying the works of Christ. Christology, according to the author, is the hope and rationale for all Christian learning. This is the point he makes throughout the book, dedicating chapters to history, science and biblical study to show the difference it makes when certain theological truths are held about Jesus Christ. He comes to this unsurprising but often-neglected starting point through a few key passages from the New Testament – John 1:2-3; Colossians 1:15-16; Hebrews 1:2 – as well as the major Christian creeds – The Apostles’ Creed; The Nicene Creed; The Chalcedonian Definition. The expansive implications of Noll’s deceptively simple thesis is what makes this book so important. Consider: If, as the biblical passages above claim, Christ is creator, sustainer, and purpose of the universe, shouldn’t Christians be the most curious of all people? Wouldn’t we expect to learn more about the one we claim as Savior and King as we pursue wide-ranging studies? Rather than leading to the sort of anti-intellectualism evangelicals can be known for, Noll shows that belief in Jesus as Lord provides all that is needed to intellectually motivate the serious scholar and ordinary person alike. Noll covers a lot of ground in a quick 167 pages, far too much to summarize here. The pace slows down at points (at least for this non-academic) but the payoff is always worth the effort. Other portions move quickly, with implications that provoke the imagination. Chapter 3, “Jesus Christ: Guidance for Serious Learning,” was one such section for me. Here the author provides “four general expectations that might inform intellectual life” based on “the nature of Christ’s person and work.” These expectations – duality, contingency, particularity, and self-denial – provide an attractive vision of distinctly Christ-centered learning. Evangelically-oriented Christians have often not taken seriously the biblical command to love God with our minds. Jesus Christ and the Life of the Mind shows the pointlessness of this sad fact while providing plenty of hope for a different future.